You may have seen my name around if you've dealt with RPG Maker any bit. I'm a scripter/plugin maker for RPG Maker MV and I do it because I absolutely love RPG's! But as much as I love playing RPG's, I love making them. Nothing beats the feeling of seeing your dream RPG come to life and playing it for yourself. But what beats that feeling is the magical feeling of letting someone else play your game and knowing that you've made them smile. Well, over here, I want to become your number one source for making that dream game of yours with my scripts/plugins for RPG Maker MV! And I create all this content for you all... FOR FREE! Why do I make content for free? That's because the majority of RPG Maker users are in the Indie Game scene. As far as that goes, I, too, have been in the Indie Game scene before, and I know the pain of not having a budget that bigger video game groups and companies have. The struggle to find good coders, good artists, good musicians, etc. can be tough so as an Indie Game maker myself, I want to support you so that way as much as I can through the resources and content I make, we can both have our dreams come true. Your support keeps Yanfly active and making resources for your game! You can think of it as buying a good friend some lunch or coffee as we work together on a common goal: your game. A dollar on average would be a great help in letting me to keep doing what we do! You can get access to the Patreon-exclusive Plugin Polls where you can vote for the plugin(s) you wish to see Yanfly make next! These polls will last until the next poll available. Yanfly will then work on the winner(s) of that poll to make a brand new plugin selected by the community! You can get access to Yanfly's Sample Project that is updated every Monday Night! With it includes all currently released plugins pre-installed and optimized (though if you have plans on copy/pasting the settings over to your game, you'll still have to adjust it individually for certain plugins) and the many Tips & Tricks displayed on Yanfly's channel! You'll not only gain the sample project, but also gain access to Yanfly's Patron-Exclusive Debugger plugin! The debug menu, by default, can only changes switches and variables. With Yanfly's Debugger, the range of things you can do for playtesting expands tenfold! From accessing a teleporter to anywhere (and any tile) to initiating battles whenever you want, launching common events whenever, to altering even actor and enemy states straight from the menu, Yanfly's Debugger will give you exactly that level of control. Top this on top of the Sample Project with all the Tips & Tricks and you'll be good to go! 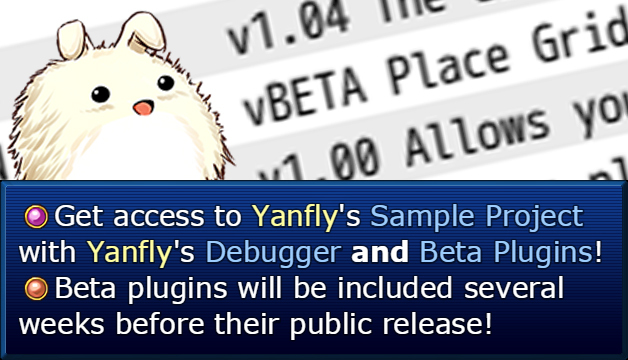 You'll gain not just the regular sample project and the Debugger, but you'll also gain access to all of Yanfly's beta plugins! These plugins will not be released for quite a few weeks (and maybe months) as they're being tested by Yanfly in the meantime. However, you can access them right here! Archeia - Thank you for letting me into beta for RPG Maker MV. Always keeping me updated and figuring things out together to make this the best RPG Maker yet. Let's walk together towards success. FlyingDream - Thank you for all you've done to me. You have a very special place in my heart and I'll never be able to get as far as I did without you supporting me from behind like always. When it comes to support, you're second to none. We had a lot of wonderful moments together that I'll never ever forget for the rest of my life. Thank you. Rukaroa - Thank you for always staying a wonderful friend and giving me so many ideas to work with. It's always a blast to work together with you. Ækashics - Working together with you is such a fun experience especially with all your zany ideas and wonderful concepts! Looking forward to doing more with you! And to all my supporters - I'm happy you're all faithful users of mine and had it not been for you believing in my work these past years, I probably wouldn't even be here right now. Thanks for your support! Access to my activity feed on what I'll be working on next! Included are screenshots of progress made, what kinds of things to expect for the next plugin release(s), etc. Want to list your game and/or website on Yanfly.moe! Now you can! Each certain Mondays of each month, the Yanfly Engine Plugins Sample Project will be updated and you can access it! In it will contain all currently released plugins pre-installed and optimized (although if you're copy/pasting to an already existing project, it's best if you tweak the settings still) AND a majority of the Tips & Tricks shown on the channel! There may also be some W.I.P. plugins included, too! This way, you can start new projects with a peace of mind! Includes rewards from previous Tiers! Access the Yanfly Engine Plugins Sample Project that is updated on certain Mondays of each month! Want to put an NPC or few of your choice into the Sample Project? Want some of the playable characters from your game in the Sample Project? Certainly! You can choose how they look, what they say, and what they do, including a link to your game and/or website! Be sure to send us their face, sprite, and dialogue through Patreon's inbox! Custom NPC(s) of your choice made for the Yanfly Engine Plugins Sample Project! Gain access to the Yanfly Engine Plugins - Debugger! This Debugger is personally made by Yanfly and has a large variety of functions to make playtesting your game easier and more efficient! After all, less time needed to test stuff means more time creating and finishing your game! 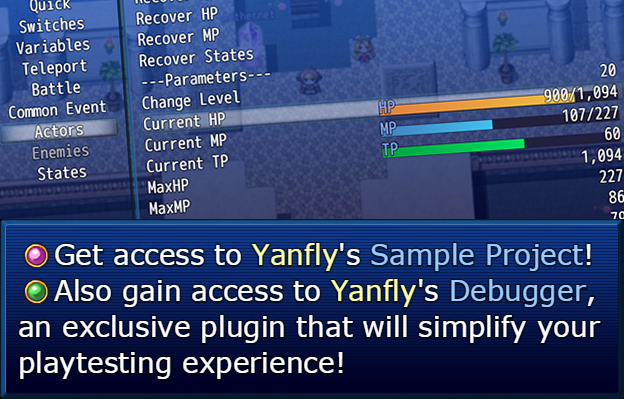 The Yanfly Engine Plugins - Debugger will be included with the sample project that is updated certain Monday! Be sure to send me a message how you want your custom NPC to look, what they say, and what they do! The Yanfly Engine Plugins - Debugger is now yours! Added onto the Special Thanks of each video's description! Care for some extra exposure? In addition to getting Yanfly's Sample Project that comes with the Debugger, we'll put your website image link down as one of our sponsors on the sidebar of Yanfly.moe! Once there, it will appear on nearly every single page of the website! Yanfly.moe gets tens of thousands of unique visitors viewing its pages every single day. Talk about lots of exposure! Place your website's image link on Yanfly.moe's sidebar! Be sure to send a message to Yanfly about it! Want to see what we are working on? You definitely can! Included here will be "beta" versions of the plugins that will be featured later on our channel and you can access them early! Be warned though, they're in the "beta" stage for a reason and won't be the complete product yet. However, the fact we've included it there means it's semi-stable enough to be used! These "beta" plugins will be included with the Yanfly Engine Plugins Sample Project updated certain Mondays! "Beta" plugin early access via the Yanfly Engine Plugins Sample Project! To be reached! New Skill: More Bonus Content! Many of you have been asking for more advice videos or small plugins. Once this is reached, bonus will be made more frequently! We're talking 2 to 3 each month as opposed to the current 1 to 2 each month!